RAVENOL Motobike V-Twin SAE 20W-50 Fullsynth. is a high grade, fully-synthetic 3-in-1 lubricant with synthetic components and specifically attuned, innovative additives for bike engines, drive and crank shafts. It is especially suited for cruise and chopper motorbikes. 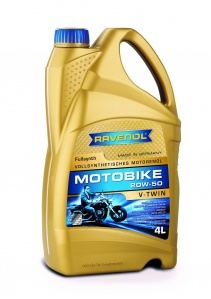 RAVENOL Motobike V-Twin SAE 20W-50 Fullsynth. reduces the friction and reliably protects the valves and the crankshaft against metal-to-metal contact. It demonstrates excellent stability and durability against thermal loads under extremely high temperatures that can occur in air-cooled V-twin bike engines. This consistent viscosity reduces load peaks at high temperatures, protecting the engine.